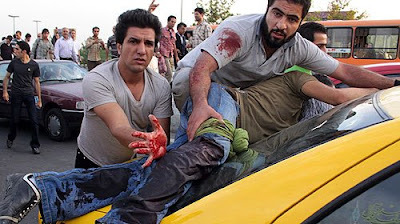 Breath of the Beast: Iran: Where the Blood is real and "The World is Watching"
Iran: Where the Blood is real and "The World is Watching"
The crowds in Tehran and other major cities of Iran are no longer chanting “Death to America” and “Death to Jews”. It is exciting and even hopeful that there is, at least, a sizable element of the Iranian population that seems to want freedom from the Mullahs. The attention of much of the world is riveted on the events in Iran and rightly so. For the first time since 2001 it is possible for the world to imagine that the tidal wave of Islamic fascism that has ravaged the Islamic world and killed so many in the free world might someday soon begin to recede. The courage of the Iranian people who are today facing riot batons, Kalashnikovs and tanks with their massive crowds and rocks cannot be ignored. There are many lessons they can teach us. Some are obvious- That freedom is worth fighting for- is the most obvious. There are a lot of other lessons here that may not be so obvious. This blog was started because the screaming mobs and incessant chants of the Iranian street mobs of the early 1980’s brought a dark presence into the life of my daughter who was then only five years old. Because she is Jewish and American the chants of Death to America; Death to the Jews” had inspired one of her little school chums to threaten kill her. So I have been very interested to hear that the crowds are now reportedly shouting out: “Death to the dictator; Down with this falsified, populist government; People why are sitting aside, Iran has turned into Palestine”. Palestine? Now, I know that for most of the protesters it is just a simple rhetorical device in which the Iranian mob is now equating the rulers under which they have lived for thirty years with the Israeli government and comparing themselves with the Palestinian refugees. It is a sad reminder that the complicity of the pusillanimous western media and the ineffectual Israeli public relations apparatus have allowed Israel to be maligned and used as a symbol of oppression. But there are also subtle resonances and cruel ironies in that chant. The first and most stark of these ironies is that, in course of a week’s protests, in a country where western media has been largely deported and universally intimidated there has been more convincing evidence of brutality and bloodshed of innocent people by the government than in the entire sixty years of Israeli history. Compare, if you will, the world famous bloodless blood libel of the al Durah incident with the heart breaking video of Neda, the young woman deliberately shot by government militia in Iran. Note: Before you click on the video from Iran, be advised, it is very disturbing. Yet that same world is oddly mute before the real blood pouring out of the Iranian girl from a single wound. Real blood and real pain in the body language of the Iranian makes stark contrast with the smirk on the face of the unbloodied Palestinian actor. Why was al Durah such a "game breaker" against Israel, a country whose only sin was not defending herself from the libel intelligently enough, and the obviously real bloody murder of this girl is not stirring a tenth of the moral outrage against Iran? Picture an Obama reaction against Israel, had he been president at the time and than think about his treacly "The World is Watching" caution to the mullahs. The ultimate irony, though, lies in the reports (verification needed) that among the government militias and police that are beating and shooting protesters there are cadres of Arabic speaking fighters. These are widely presumed to be Hamas and Hezbollah militants. It is not so much, then, that Iran has become Palestine. It is more that the morbid Islamist obsession with the destruction of Israel (based, of course, in their fear and loathing of the west) has, ironically, turned the tiny scapegoat into a real threat. The Iranian people are suffering the result of thirty years of allowing themselves to be tricked into shouting “Death to America; Death to the Jews”. Many Iranians will tell you that they never supported the Islamist regime. But you never heard them complaining very much about the proxy armies of Hamas and Hezbollah that the mullahs trained and financed to surround and threaten Israel. Israel was always the “safety valve” the one thing that, even if they did not agree on it totally, they could find some neutral common ground in deploring “The Zionist Entity”. So, now those proxy armies are in the vanguard against the protesters. Being used to provide brutality against Iranians that fellow Iranians may be finding difficult to apply in the streets of their own cities. So, yes, in a way, Iran has become Palestine: a place where violence and brutality is committed by Palestinians against people they have no real reason to hate under the mistaken impression that it will solve a problem that they have created for themselves. And they insist on turning their cultural problems into our security problems. It is, at bottom, a cultural problem and unless we in The West break down our self-imposed prohibition against discussing cultural differences in a critical way, we will never be able to figure out how to protect ourselves. As Richard Landes ( in an excerpt from his forthcoming book now up at Augean Stables) wrote,"One of the more important dimensions of honor-shame self-help justice is the negative premium it places on self-criticism. The tendency of those who have been shamed by others is to blame the other for the insult." We shame them by our sucess and our liberty- they have a deep need to punish us for it. Iran makes no less than 3 countries where it has been reported that local despots relied on "Palestinians" to serve as tools of repression, where specially energetic cruelty and mindless obedience to orders were required (Kuwait and Iraq being the 1st two). How revealing that these people who've been feted, indulged, and fawned over by the international community for ~50 years, seem so eager to serve as the new Hessian mercenaries of the 3d world...except the Hessians were never so bloodthirsty. Yes! Welcome back! I was literally fixin' to email you to see how you were doing when note of this post arrived! It is so disturbing to hear our journalist and news readers talk about this turn of events in Iran. Their chatter is totally meaningless as if they haven't a clue as to what is unfolding before their eyes. Glib nihilism has turned their critical thinking abilities into devolved slime. I am appalled! And to have such a philosophical nihilist as the President of the U.S. is frightening. He knee jerkily opposes anything having to do with traditional American values of liberty and freedom along with our Judeo/Christian heritage. This makes him even worse than incompetent. The breath of the beast is present and dangerous to anyone standing in defiance to tyranny and oppression. We live in the best of times and the worst of times. I long to stand shoulder to shoulder with the young people of Iran. If I should perish, then so be it because I wouldn't want to live in a world that would kill the young people who desire liberty and choices. This is why the Tea Party movement is so important here in America. Stand with others in defense of individual liberty. Let all our voices be joined across the entire earth. Let all tyrannical regimes tremble in fear. Well written and I am pleased to see you blogging again.